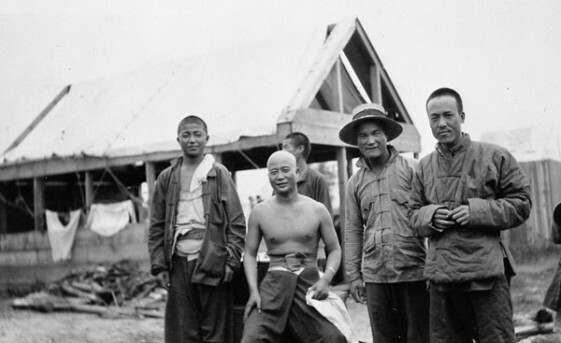 Yet Chinese were singled out as a group for systemic discrimination and exclusion by the state, which used its legislative powers to disadvantage them and deny development of an identity and community in Canada. Gum San – Gold Mountain – was drawn by early Chinese migrants on their mental map of the world when gold was discovered in California in the mid 19th century. The 1848 California Gold Rush gave rise to a mass migration of fortune hunters from Europe, Australia, Latin America and throughout the Chinese diaspora to North America. 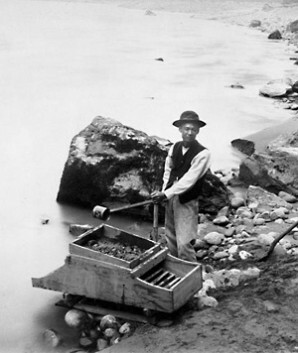 Ten years later, gold was discovered at British Columbia’s Fraser River, where it joined the Thompson River, and a new rush of prospectors, many of who had settled in San Francisco, made a beeline for Canada. The gold rush brought the first major migration of Chinese to lands that nine years later would become Canada, a dominion under the British crown. Competition for prospecting rights and other business associated with the gold rushes led to conflict between European, American and the visibly different Chinese, who often found themselves at the harsh end of justice on the frontier. Racism and prevalent social values of the day resulted in discriminatory legislation against Chinese on both sides of the border.